It’s that special time of the year again! The time of year where we reminisce about how hysterical it was when the shitter was full, when people get together and wear intentionally lame sweaters, and get pretty tanked up and make poor decisions. Either way, it’s usually a blast. But what’s a holiday season without a badass soundtrack to play in the background? 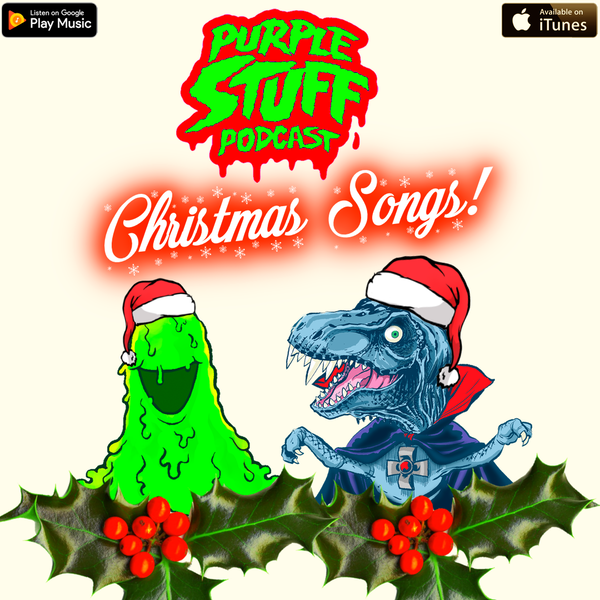 The new episode of the Purple Stuff Podcast continues our tradition of offering up an eclectic selection of Christmas tunes for you. Hopefully we can provide you with some new ideas to add to your annual holiday celebration…or just a bunch of songs to avoid at all costs, whatever works for you! You can subscribe to The Purple Stuff Podcast on iTunes and basically anywhere else you can get podcasts. If you want to support the show and our websites, subscribe, spread the word, or leave a review on iTunes! Thanks for reading and listening! Purple Stuff Podcast: Home Alone! On the NEW episode of the Purple Stuff Podcast, Matt and I talk about HOME ALONE! It’s one of our favorite holiday movies from our youth and we each bring a mixed bag of stuff to pore over. It’s a celebration of the film so if you love it as much as we do, this is for you! 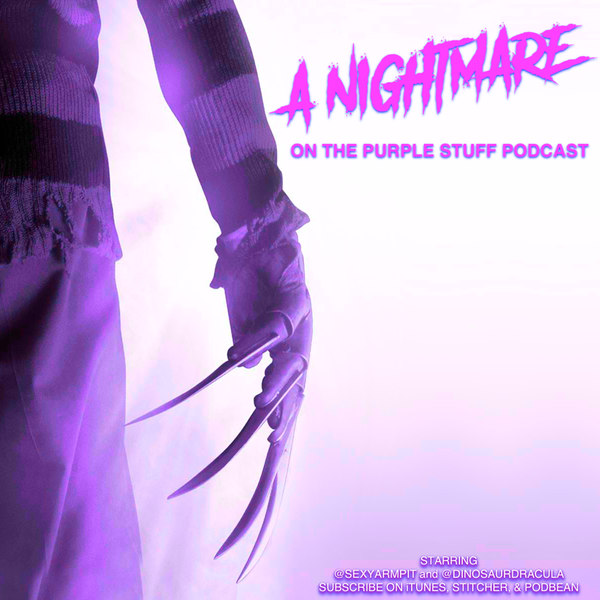 Purple Stuff Podcast: Creepy Q&A! The Purple Stuff Podcast returns from beyond the grave! 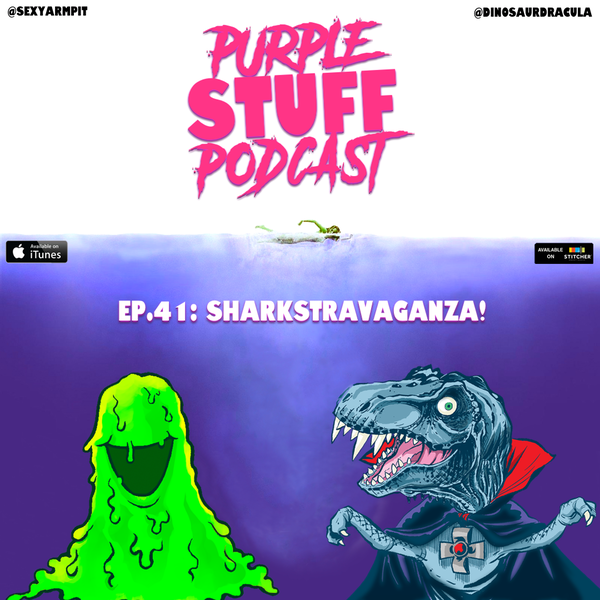 Matt from Dinosaur Dracula and I fielded your creepy questions on the show’s Twitter account @purplestuffpod and there was a resounding response! Thanks for sending them in! We had a slew of great Halloween/Horror-centric ones, but we were only able to answer a select batch of them. Hope you enjoy hearing our answers and we’d like to hear yours as well! Have a Happy Halloween and thanks for listening! A new Purple Stuff episode is available to listen to NOW! After the seriously amazing response from our Friday the 13th episode, the logical next step is to head down to the boiler room. For those hoping to hear Matt and I have a horrific run-in with Freddy Krueger, you’re in luck! Many of our local peeps are at the Monster Mania convention in New Jersey right now. While Matt and I didn’t make it to the con this time, we’re there in spirit. We may even invade your earbuds and bluetooth speakers in your hotel rooms while you’re drinking post-con. A show covering one of our favorite horror franchises is ready for you to hear. The NMOES series is so beloved, especially by our generation, and we wanted to record a show all about these films and the ways that they stuck with us all these years. During our little trip to Elm Street, you’ll hear us discuss everything from cool movie moments, to action figures, to drinking with the Dream Warriors themselves. We’ll even give you a ton of fodder to discover for yourself on YouTube. We had a lot of fun recording this one, as we usually do, but if you’re a Freddy fanatic, this one is for you! *WARNING* If you listen to this one late at night…whatever you do, DON’T FALL ASLEEP! Thanks for reading and listening to us. We appreciate all of your support and you can help out the show by subscribing on iTunes and leaving positive feedback for us! 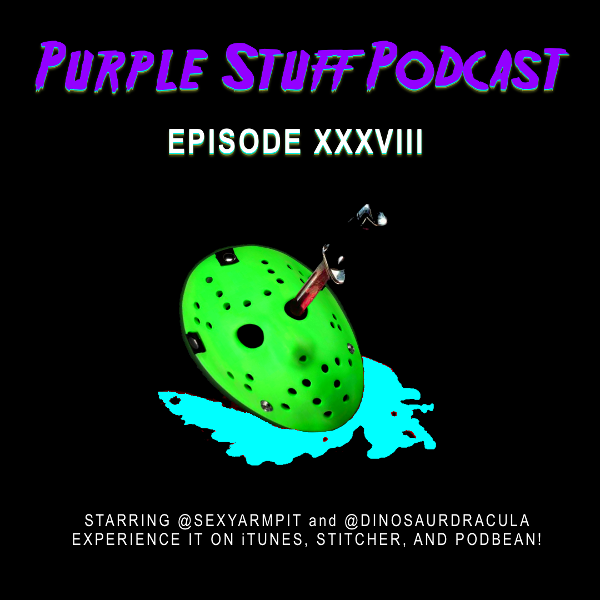 PURPLE STUFF PODCAST EP.38: FRIDAY THE 13th! 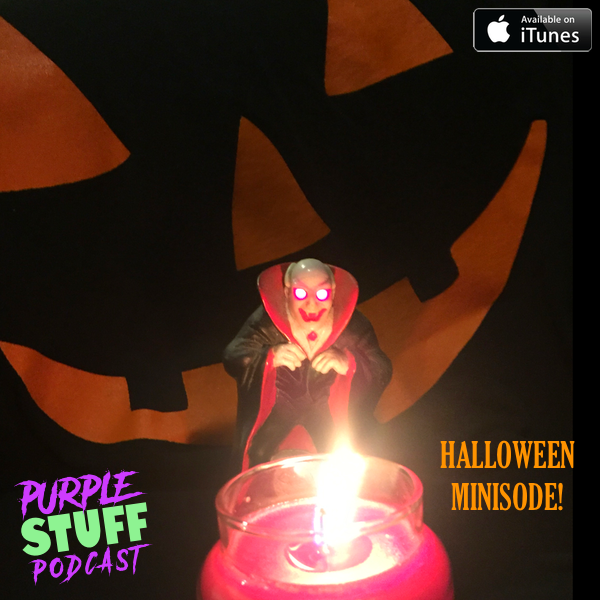 You can also SUBSCRIBE to The Purple Stuff Podcast on iTunes, Podbean, and Stitcher! 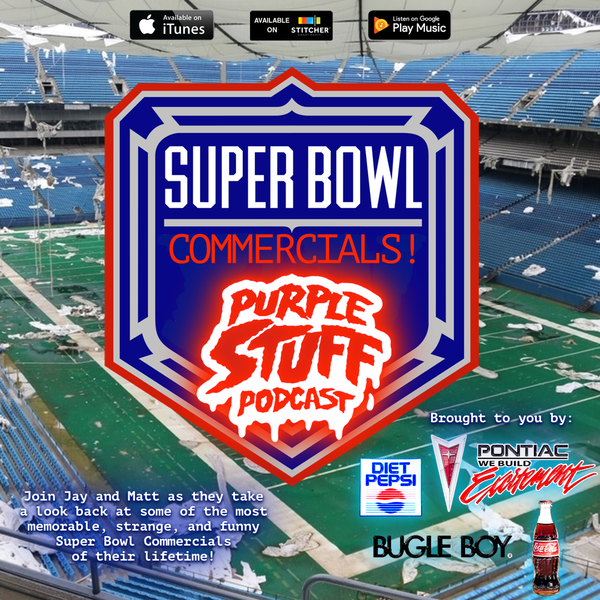 Matt and I have a new Purple Stuff Podcast to help kick off your weekend! Many of you have a 3-day weekend so this means you have an extra day to listen to the show twice! As you can clearly see from the picture that I made above, we’re going to be sitting around a fire at Camp Crystal Lake and discussing some of our favorite aspects of one of the greatest horror franchises of all time, Friday the 13th! We have a lot to say so this resulted in a slightly longer episode than usual. 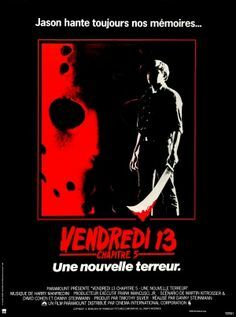 Personally, Friday the 13th was one of the earliest horror franchises I got into. Admittedly, I probably shouldn’t have been watching them at 5 years old, but I wasn’t a bad kid, so with that came some perks. Staying up late and watching Friday the 13th marathons on channel 11 was one of my favorite things to do. Since the F13 franchise has had such a long life, it’s essentially grown up right along with me (and you too, I’m sure). Whether you’re more of Jason Takes Manhattan mark or a Friday IV fanatic, you’re in the right place. We all have soft spots for particular installments, songs, scenes, moments, and other instances of Jason in pop culture, so we bring to the table all kinds of nonsense that we dig so much about these films. Everything from Jason without his mask on to Jason on MTV is covered. Do you see a familiar face hidden in the poster above? We had a lot of fun delving into what is collectively one of our favorite horror franchises. It’s even more special for me because of the film’s New Jersey roots. I can’t wait for you to hear this one and if you are in the mood to share, leave us some of your favorite moments in Friday the 13th lore in the comments below! Thank you for reading and listening! Please share the show or tell a friend! PURPLE STUFF PODCAST EP.37: SNOW DAYS! Let us help you banish the winter blues away with a NEW episode of The Purple Stuff Podcast! In the latest installment, Matt and I get a snow day. As kids, snow days would entail getting bundled up, playing in the snow, throwing snowballs, making snow angels, building forts and coming in freezing with wet socks. Then after all that nonsense, it was time for hot chocolate and movies or cartoons. Those were the best kinds of days. Then you’d spend the rest of the night with your fingers crossed that a call would come in that you didn’t have school the next day. Hearing that news was the ultimate victory because that meant you could stay up late and plan an unexpectedly awesome evening for yourself. The world was your oyster. Adult snow days aren’t as fun. Shoveling, risking car accidents, and having to work from home are just some of the pitfalls of an adult snow day. But it doesn’t have to go down like that! 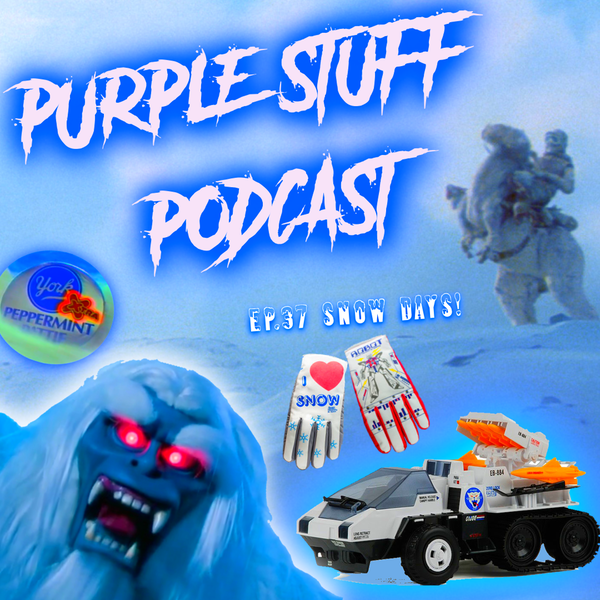 Join us for the Purple Stuff Episode 37 where we recall our snowy memories. It’s a wintry mix incorporating anecdotes, songs, and toys. Hope you enjoy it and if you feel like leaving some comments about your own snowy memories or favorite wintry things that would be awesome. PURPLE STUFF PODCAST EPISODE 35: GIVING THANKS! The Purple Stuff Podcast is back with a special Thanksgiving episode! In this installment, Matt and I express our gratitude for all kinds of random stuff. Sure, we should all be giving thanks for our families and the food we’ll be devouring on Thanksgiving, but let us not forget about things that we may not give thanks for on an everyday basis such as Capn’ Crunch and the Coming out of Their Shells Tour. There’s a little wrestling talk, a little Christmas chatter, something for everyone. We also discuss crap that only Matt gives thanks for…like a certain bizarre beverage that he has an affinity for. You’ll hear all that and more in this cornucopia of audio nonsense. Please enjoy it before you fall asleep on the couch watching football! Thank YOU for listening and reading! Happy Thanksgiving everyone!